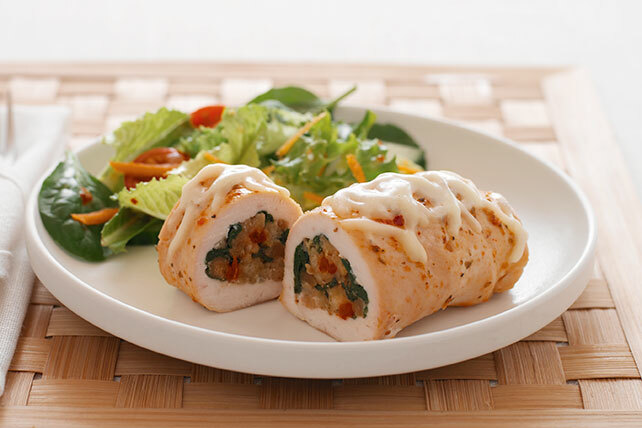 Celebrate inner beauty with our Spinach-Stuffed Chicken Breasts recipe. It's what's on the inside that counts with these Spinach-Stuffed Chicken Breasts. Place 2 chicken breasts in large freezer-weight resealable plastic bag. Pound chicken with the side of a heavy can, rolling pin or meat mallet until chicken is 1/4-inch thick. Remove chicken from bag; set aside. Repeat with remaining chicken breasts.